In a lot of ways, God is always reaching for us: through circumstances in life, through hardships, and through joys. God is an intimate and loving Person Who is all the time on the lookout for a way to draw nearer to us. But if we do not reach back, we can never experience the depths of a fulfilling relationship with Him. Nothing in Heaven or on Earth can change our lives for the better, more than a personal relationship with the Lord. In such a lot of ways, God is all the time reaching for us: through circumstances in life, through hardships, and through joys. God is an intimate and loving Person Who is all the time on the lookout for a way to attract nearer to us. In this book you’ll discover the seven greatest prayers which will create a life changing, heartfelt relationship with God. Being both a study and a prayer devotional The 7 Most Powerful Prayers That Will Change Your Life Eternally will teach you the seven most essential keys for growing nearer to Him. 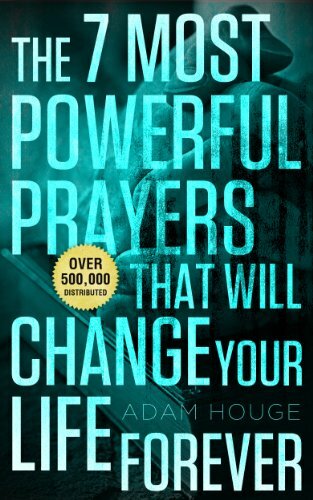 Hey Buddy!, I found this information for you: "The 7 Most Powerful Prayers That Will Change Your Life Forever!". Here is the website link: https://christiansttshop.com/product/7-powerful-prayers-will-change-life-forever/. Thank you.